WE LOVED THE BEACH CLUB. THE 2 BEDROOM APARTMENT WAS FANTASTIC. Beach Club Apartments are private let self contained luxury holiday apartments within the Peppers Beach Club Resort complex. Our private collection of Palm Cove accommodation Beach Club Resort Apartments are a selection of individually owned premium luxury holiday apartments that offer elegance, prestige and five star style sophistication to families visiting Palm Cove. The Peppers Beach Club Resort complex is the most popular of all our Palm Cove accommodation. and our private let luxury Beach Club holiday apartments sell out very fast when we offer our best holiday package deals. These great value holiday apartments are a selection of Hotel Spa Rooms for short term holidays, larger One and Two Bedroom apartments and Penthouses, all splendidly appointed with picturesque pool and beachfront views and a central location within the Peppers Beach Club Resort in the Palm Cove village. These luxury Beach Club Resort holiday apartments are a collection of individually privately owned strata titled units that are managed off site but all guests still have the full use of all of the holiday resorts public facilities and the services of the resort such as the restaurant and pool bar on a pay as you go service. Because our apartments are privately owned we can offer the best price on our Palm Cove Accommodation to you direct, beating any hotel resort deals. We often have stay pay deals with free nights and other added inclusions. Ask about our 2019 Palm Cove Accommodation deals. Our team are here and local so you can talk to us about your Palm Cove accommodation needs 7 days a week as we are the Cairns Holiday Specialists. Honeymoon Bonus - Complimentary Bottle of Sparkling Wine on arrival for Honeymooners! Fully self contained and features a king size bed in separate bedroom and capacity for two guests, or three with a rollaway bed (fees apply). Optional upgrade to One Bedroom Swimout with direct access to the Serenity Pool, or One Bedroom Penthouse with external access to Rooftop deck with Plunge Pool or Spa and BBQ facilities. Fully self contained and made up of Hotel Spa Room and 1 Bedroom Apartment, with two king sized beds or one king and two single beds, with capacity for four guests or five with a rollaway bed (fees apply). Optional upgrade to Two Bedroom Swimout with direct access to the Serenity Pool, or Two Bedroom Penthouse with external access to Rooftop deck with Plunge Pool or Spa and BBQ facilities. The Peppers Beach Club is a five star style holiday resort complex located right in the heart of Palm Cove Village with views of the Palm Cove beach and out to the Great Barrier Reef. Enjoy some of the many facilities on offer at the Beach Club Apartments and Resort including a world-class Day Spa, a selection of restaurants and a sandy lagoon-style swimming pool. These privatley owned holiday apartments within the Peppers Beach Club Resort complex are set amongst flourishing tropical gardens and have open-air white washed walls and plantation shutters and a Mediterranean style theme that fits perfect with the balmy tropical ambiance of Palm Cove Australia. Each of one of our holiday hotel rooms and apartments at Beach Club Reost Apartments feature large contemporary interiors that flow effortlessly onto generous ‘live on’ balconies. The apartments are warm and inviting, providing all the creature comforts of home in this lush tropical paradise. Fully equipped gourmet chef style kitchens and laundries feature within the apartments, offering all the conveniences of home while on holiday in Palm Cove Queensland Australia. The Hotel Suites and Apartments at the Beach Club Resort Apartments all feature air conditioning, tea and coffee making facilities, an in-room safe and entertainment facilities including cable television, a stereo and internet connectivity. Each of one the Hotel Rooms feature the deluxe inclusion of a whirlpool Spa Bath nestled on the large ‘live on’ balcony. This romantic feature is ideal for honeymooning couples, or those that simply want to relax amongst the understated decadence that is the Beach Club Holiday Resort. Interconnecting rooms are available, and all Two Bedroom Apartments are a combination of the Hotel Suite and One Bedroom Apartment, thus featuring a whirlpool spa also. We have the largest range of private let holiday accommodation in Palm Cove ranging from swim up rooms, penthouses with private pools, spas and bbq's, studios, resorts and luxury private holiday homes. We canno be beaten on our private let holiday apartment quality of accommodation or holiday package deals. The Peppers Beach Club Resorts facilities are exceptional and include 3 Swimming Pools, a Day Spa and gourmet restaurants. One of the best features of the Peppers Beach Club Resort and Spa is its sensational tropical location, directly opposite the golden shores of Palm Cove Beach. The saltwater lagoon swimming pool is the central feature of this popular Palm Cove Resort, and boasts a white sandy beach surrounded by swaying palm trees. This sandy based bottom graduates to the deep centre of the pool making access easy for all age groups. The swim-up bar provides an alluring invitation, and holidaymakers often relax in the cool sapphire water of the lagoon pool sipping an exotic hand-crafted cocktail. Hidden at the back of the Palm Cove resort is the rainforest swimming pool known locally as the serenity pool where the adults go for some privacy and time away from the resorts main swimming pool. Reminiscent of a rainforest rockpool, this cool and shaded swimming pool provides an abundance of privacy and tranquility at the Peppers Beach Club Resort and Spa. The third swimming pool is an elegant pool surrounded by carefully crafted gardens and water features, adding a touch of distinction to this five star tropical resort. Gourmet restaurants feature predominately throughout the Village of Palm Cove, and some of the finest restaurants call the Peppers Beach Club Home. For a taste of the orient, Choc Dee’s Thai Restaurant is a sensation for the senses, and the authentic cuisine utilizes the freshest and finest ingredients from the region and turns them into Oriental delights. Our seafood restaurant specialises in freshly caught seafood cuisine and features a lovely waterfront location. Lime & Pepper Restaurant is the Peppers Beach Club’s signature restaurant, specializing in contemporary Australian cuisine, with a focus on sumptuous seafood plucked directly from the ocean of the Great Barrier Reef. Lime & Pepper Restaurant Palm Cove is open for breakfast, lunch and dinner seven days a week. Hours of operation are breakfast: 6.30am – 10.30am, lunch: 12:00pm – 3:00pm and dinner: 6.30pm – late. Other resort facilities featured at the Peppers Beach Club Resort, including a fully equipped fitness centre and business facilities use of these facilities can be arranged direct with the property on a pay as you go basis. The Beach Club Resort and Spa is ideal for guests seeking a five star style tropical haven on their holiday, and the combination of luxury accommodation, sensational location and decadent resort facilities make the Beach Club Resort the ideal destination on a Tropical North Queensland holiday. Palm Cove is a sophisticated beachside Village, renowned for its pristine tropical beach, unbelievable selection of award-winning Day Spas and gourmet eateries. 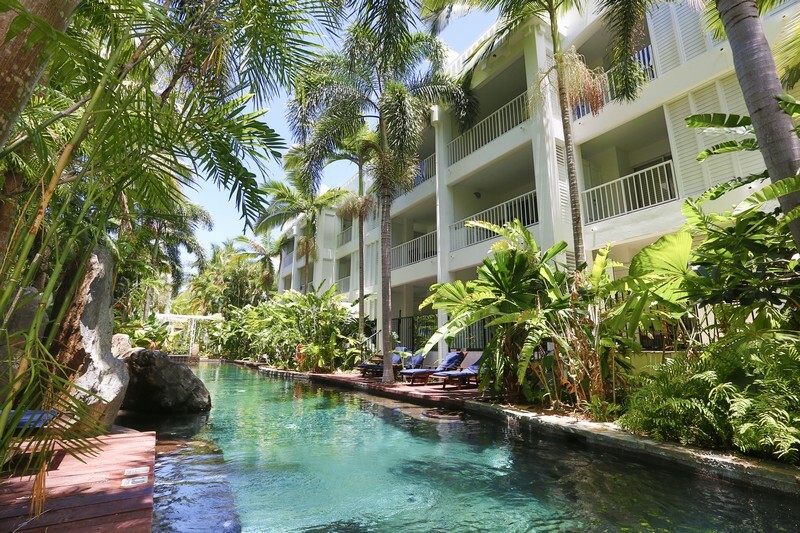 Nestled between the reef and the rainforest, Palm Cove is ideal for those who want to explore the region, or for those that simply want to relax poolside with a fruity cocktail. Whatever your holiday preference, The Tour Specialists have an activity that suits. For information on tours and attractions call our office The Tour Specialists on 07 4059 5959 for some local advice. Day trips depart daily from Palm Cove to The Great Barrier Reef, Kuranda and the Daintree & Cape Tribulation world heritage Rainforest. Ensure to ask us about Palm Cove day tours and holiday packages for your holiday in Palm Cove, Queensland. We can tailor make a holiday package to suit the needs of couples, families, Honeymooners, thrill-seekers, and large groups! Palm Cove is located in the northern beaches district of Cairns Australia, 30 minutes north of Cairns City, and 25 minutes north of Cairns International and Domestic Airports. Your holiday apartment is located within the Peppers Beach Club Resort complex but check in is off site so please ask our friendly reservations staff to organise your airport transfers to the check in location. Please Let us know if you would also like us to book your Cairns to Palm Cove Airport Transfers. We can arrange a variety of transfer services including Stretch Limousines and coach transfers for larger groups. Your Apartment is managed offsite, guests will need to check in and register at; The Information Station (at Coral Horizons)	137 Williams Esplanade, Palm Cove. Office Hours: 09:00am - 6:00pm Mon -Sun. Please ensure to advise arrival details for key collection. Choose from a spacious Hotel Style Room perfect for the business traveller or couples, a large One Bedroom Apartment or a huge Two Bedroom family size Apartment. Large lagoon swimming pool with swim up bar, located on the beach of Palm Cove, opposite playground and patrolled beach. Great Family resort with great accommodation deals. Cancellation must be advised in writing. Cancellations received within 30 days of arrival 1 nights fee, within 14 days of arrival 100% of booking charged. Extra Person $50 p/night, Cot Hire $10 p/night. Children 0-3 stay free in existing bedding. Additional fees are not calculated automatically in the total cost and must be paid for separately on arrival. Please note this apartment is a privately owned and managed holiday apartment within this resort. You have full use of all resort facilities. Check in will be off site so please advise of arrival time. Resort Spas are perfect for an indulgent weekend, with a spa bath on the balcony. There are ceiling fans as well as air conditioning and a plush king-size bed.There is wireless internet at the resort with access fees. Food & Drink - Refrigerator, coffee/tea maker. There is wireless internet at the resort with access fees. Located near the swimming pool, this room features a balcony with a 2-person spa bath. It includes tea/coffee making facilities and an en suite bathroom with a shower. . There is wireless internet at the resort with access fees. Spa rooms feature a king size bed, tea and coffee making facilities only. You will enjoy an ensuite bathroom with shower as well as a spa bath on the balcony.….it is a great place to enjoy your morning coffee. There is wireless internet at the resort with access fees. This Studio has 1 bedroom and 1 bathroom, the master bedroom is well-lit with its own flat screen television and ensuite. The balcony overlooking the main lagoon pool ….it is a great place to enjoy your morning coffee. There is wireless internet at the resort with access fees. Non-Smoking….it is a great place to enjoy your morning coffee. There is wireless internet at the resort with access fees. The balcony,complete with spa bath, overlooks the serenity pool ….it is a great place to enjoy your morning coffee. This One Bedroom Premium Studio Apartment has all you need to enjoy your holiday. King sized bed with crisp white linen, with Ensuite bathroom, Kitchenette, Laundry and open plan lounge dining area that leads to a balcony to relax with plantation shutters for privacy that open up to give you amazing resort views. 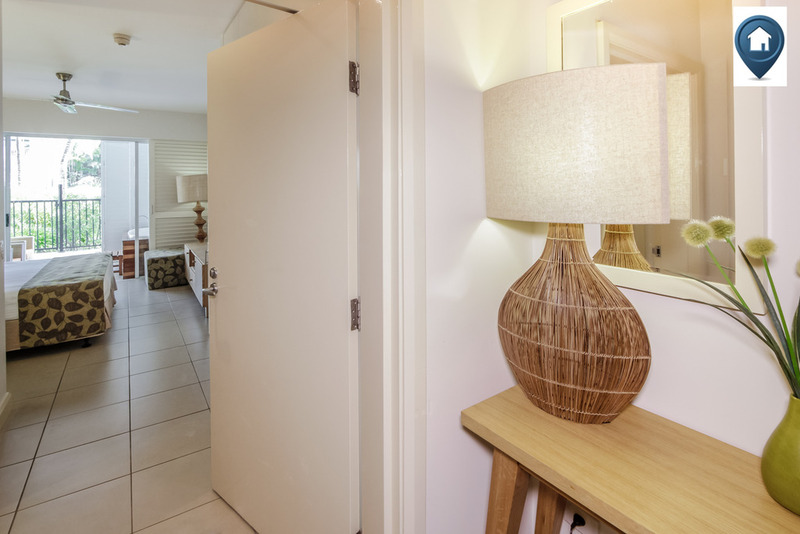 This one bedroom penthouse apartment located within the Beach Club Resort Palm Cove has recently been fully refurbished with designer taste and fittings. Located in the 500 block of the resort on the 3rd floor with private roof top terrace complete with Jacuzzi & BBQ. What a place for two of you to relax and take in the sea breezes at beautiful Palm Cove. The bedroom features a king split bed with ensuite, and you will also find a private balcony with your very own spa for you to indulge after a day spent by the pool. The one bedroom penthouse apartment is extremely spacious with an open plan living and dining room as well as kitchen area with all you need to enjoy your beach getaway. This apartment has 1 bedroom and 1 bathroom, the master bedroom is well-lit with its own flat screen television and ensuite. This apartment has a fully equipped kitchen including a dishwasher, microwave and cook top it also has a laundry with a washing machine and dryer. The dining and open plan living area has a comfortable couch. The TV in the living which has Austar is also attached to a DVD player. The dining area has a table to sit 6 people and the living area has a comfortable couch. The TV in the living which has Austar is also attached to a DVD player. The balcony overlooking the main lagoon pool ….it is a great place to enjoy your morning coffee. This Apartment has FREE WiFi! This stunning one bedroom apartment offers total relaxation in modern comfort. Featuring a queen sized bed, fully equipped kitchen with dishwasher and a separate spacious lounge and dining area. Additional features include laundry frailties, private balconies, CD and DVD player. The apartment is perfect for singles or couples wanting to relax and unwind in privacy, and still have access to resort facilities and and direct beach access. The one bedroom swim-out apartment features your very own private pool, just a step away from your own outdoor bathing terrace which for couples makes it an ideal secluded spot to relax and take in the tranquil rainforest beauty of tropical Far North Queensland. This apartment is perfect to fit the needs of sun lovers who desire a little more privacy with lush views out to the stunning rainforest pool. The one bedroom swim-out apartment offers a mix of modern comfort with stylish design for relaxation. In the main bedroom of the apartment you will find a king split bed, so if required two single beds can be arranged. You will also find a bathroom with walk-in shower, as well as laundry facilities. The two bedroom apartment is stylish and charming, with quick access to the resort pool this apartment is perfect for any family’s holiday stay. The apartment features a king sized bed in the master bedroom with an en-suite bathroom with shower as well as a spa bath on the balcony. You will find a king split bed in the second bedroom, so if required two single beds can be arranged. A second bathroom is also found in the apartment. The apartment is self-contained with kitchen and laundry facilities with all the modern appliances to make your stay worthwhile. This apartment also has a lovely sitting area with outdoor furniture for you to enjoy the magic of Palm Cove. The two bedroom ground floor apartment is sophisticated and delightful, with resort pool views this apartment is perfect for any family’s holiday stay. The apartment features a king sized bed in the master bedroom with an en-suite bathroom with shower as well as a spa bath on the balcony. You will find a king split bed in the second bedroom, so if required two singled beds can be arranged. A second bathroom is also found in the apartment. The apartment is self contained with kitchen and laundry facilities with all the modern appliances to make your stay worthwhile. The two bedroom apartment is sophisticated and delightful, with tranquil tropical garden views this apartment is attractive to any family’s holiday stay. The apartment features a king sized bed in the master bedroom with an en-suite bathroom with shower as well as a spa bath on the balcony. This apartment has 2 bedrooms and 2 bathrooms; the master bedroom is of a large size and is well-lit with its own flat screen television and ensuite. The second bedroom has a king split bed so if required, two single beds can be arranged. It also has its own flat screen TV. This apartment has a fully equipped kitchen including a cook top, microwave and dishwasher. The apartment also has a laundry with a washing machine and dryer. The dining area has a table that can sit up to 6 people and the living area has a comfortable couch. The TV in the living which has Austar is also attached to a DVD player. Walk through the living area where you will find your outdoor spa and a sitting area which overlooks the lagoon style resort pool, great place to enjoy your morning coffee! There is wireless internet at the resort with access fees. Located on Palm Cove Esplanade, with its perfect white sand beach fringed by swaying palms, the Beach Club luxury private apartments are in the perfect position for you to indulge in a tropical getaway . This sophisticated resort has been designed to capture the essence of a tropical lifestyle, allowing the soft sea breeze cool you on balmy nights, it is a delight for all those who visit; and there is no surprise that guests come back year after year. The resort features 3 pools for you to choose from: the tropical lagoon pool with its white sand beaches and sunlounges perfect for children and for you to relax, the rock pool that flows along side the Swim out apartments and is surrounded by rainforest gardens and the formal pool situated near the Swim Up pool bar - perfect for adults to chill. The tennis court is located on the western side of Beach Club Resort bordering Palm Cove’s Cedar road. A small charge for equipment hire applies. The Beach Clubs Day Spa is great place for all types of exotic spa treatments including therapeutic massage, hydrotherapy and beauty treatments. The resort’s signature restaurant Lime & Pepper serves spectacular food and Australian fine wines to create an excellent dining option without having to stray too far. The mood of the resort is contemporary and chic and this is carried through to stylish Spa Rooms, Suites, Penthouses with plunge pools and peaceful Rainforest Suites. Wake up to majestic ocean views, a tranquil pool surrounded by lush gardens or the rainforest-clad mountains. Plantation shutters and open terraces create an elegant feel in rooms and corridors. The décor has a neutral palette with splashes of colour, reflecting the surroundings. This apartment has 2 bedrooms and 2 bathrooms, the master bedroom is big and well-lit with its own flat screen television and spa. The second bedroom has a king split bed so can be split into two singles if required, it has its own flat screen TV, and big windows that give off natural light. This apartment has a fully equipped kitchen including a dishwasher, microwave and cook top it also has a laundry with a washing machine and dryer. The dining area has a table to sit 6 people and the living area has a comfortable couch mixed in with some armchairs. The large TV in the living area which has Austar. The balcony overlooking the amazing pools has a spa bath as well. The Beach Club overlooks the stunning palm-fringed Palm Cove beach in Tropical North Queensland. This award winning Resort is set in the heart of the charming Palm Cove village. From the moment you arrive into the private world of Peppers Beach Club & Spa, you will be welcomed by fragrant gardenia scented air, cooled by gentle ocean breezes. Offering the perfect place to indulge in tropical relaxation, this idyllic intimate beachfront destination is situated at the start of the beautiful coastal drive to Port Douglas and majestic Daintree Rainforest and lies only 20 minutes from Cairns International airport. This two bedroom penthouse apartment located within the Beach Club Resort Palm Cove has recently been fully refurbished with designer taste and fittings. Located in the 500 block of the resort on the 3rd floor with private roof top terrace complete with Jacuzzi & BBQ. What a place for two of you to relax and take in the sea breezes at beautiful Palm Cove. The master bedroom features a king split bed with ensuite, and you will also find a private balcony with your very own spa for you to indulge after a day spent by the pool. Bedroom two has a king split which can be made up as 2 single beds if needed. The two bedroom penthouse apartment is extremely spacious with an open plan living and dining room as well as kitchen area with all you need to enjoy your beach getaway. The two bedroom swim-out apartment features your very own private pool, just a step away from your own outdoor bathing terrace which for couples makes it an ideal secluded spot to relax and take in the tranquil rainforest beauty of tropical Far North Queensland. This apartment is perfect to fit the needs of sun lovers who desire a little more privacy with lush views out to the stunning rainforest pool. The two bedroom swim-out apartment offers a mix of modern comfort with stylish design for relaxation. In the main bedroom of the apartment you will find a king bed and ensuite, the second bedroom contains a king split bed, so if required two single beds can be arranged. You will also find a bathroom with walk in shower, Spacious Kitchen Dining and Living area as well as laundry facilities. The Terrace contains an outdoor spa Bath, lounge chairs, Dining table and BBQ and leads directly to the Serenity Pool Deck with your private swimout deck containing sun loungers - the perfect place to read a book, have a cocktail then cool off in the serenity pool. Thanks for your feedback Monica. The pool at the Beach Club Apartments is certainly a highlight of the property. We are happy to her our Beach Club Apartments were the ideal option for your stay and look forward to welcoming you back soon. The apartment was really nice, very clean and had all the amenities we wanted, such as microwave, fridge, spa etc. Being able to use the resort's facilities was great and the staff were happy for us to pay for drinks or meals on our card. Would recommend the apartments to others! Thank you for the feedback, we are glad that you enjoyed your stay with us in beautiful Palm Cove and can't wait to welcome you back! Hi Cadi, the Beach Club Apartments are great for family stays and in an amazing location there on the beachfront at Palm Cove. The pool and facilities certainly make this one of our most popular properties and we enjoy having our guests return again and again. Thank you for your feedback, our team is delighted that you enjoyed your stay with us. This is the second time I have stayed at The Beach Club and as per my first stay, it did not disappoint. Hey Kim, thanks for your feedback - it's great to have you returning to stay at the Beach Club Apartments Palm Cove. These apartments offer a fantastic affordable way to have that 5 star beachfront experience. We look forward to seeing you in Palm Cove again soon. Hi Joanne, we are pleased you enjoyed your time at the Beach Club Apartments Palm Cove. This beachfront Palm Cove property is one of the most popular for sure and the Hotel Spa Rooms are ideal for a quick couple's getaway. Awesome, loved it, loved it, loved it. Lots of people boohooed us going in February, the rain, the crocs, the ocean stingers, but we didn't have a problem with anything. Palm cove and the Accommodation were quiet, the pools fantastic, our room cool. Awesome. Thank you Beach Club for making my 50th one to remember. Hi Monica and thanks for your feedback. Sometimes it is best to come during the down season as you really get to enjoy Palm Cove & Cairns to yourself. The beaches are safe to swim year round thanks to the safe swimming enclosures and the reef is a pleasure to visit at any time. The Beach Club Apartments Palm Cove is an great spot to enjoy a birthday and the Cairns Holiday Specialists are pleased you enjoyed your stay. Stayed 5 nights with my wife in a 1 bedroom swim out apartment. Beautiful accommodation with BBQ and bar fridge on patio, comfortable pool recliners on the deck and the Serenity pool was just fabulous. Yes. Great location and fantastic pool. Thank you, we are very pleased that you loved our pool and the general location. The 2 bdr ground floor Beach Club apartment at Palm Cove was fabulous! We had a terrific view over the pool and an outdoor spa pool on the balcony. The room had everything we needed and more. Pantry items, laundry detergent, vacuum, plenty of spare towels etc were all supplied. Very clean and spacious for a family of 5. The hotel itself is amazing and the beach pool, pool toys and swim up bar made for a relaxing holiday with 3 kids. The location is perfect, playground/beach across the road and food outlets/cafes within a 1 minute walk. Highly recommend. We enjoyed a girls trip away for four nights at The Beach Club. The lady at Boutique Collections was very friendly and extremely helpful, even helping us carry up our shopping from the car (sister in law who dropped us off). This is my 4th time booking through Cairns holiday specialists. Everyone is always helpful and friendly. Emails are always responded to promptly. I highly recommend them (and I do to family and friends) to anyone travelling to Cairns Northern Beaches. Thank you for such a positive feedback, we are glad that you enjoy holidaying in Palm Cove and we are hoping you will choose to stay with us again in the future. We absolutely loved our stay at the beach club apartments and would recommend them to anyone. The apartment was amazing and the pools in Peppers were so great for young families. So happy to hear the Beach Club Apartments Palm Cove were ideal for your family holiday. Being centrally located on Williams Esplanade and offering a wonderful swim up pool bar and sand edge pool, where else would you rather be? Yes, it's just perfect for families with little kids, the pool is fantastic, although a little cool in August!! Hi Justine, Thank you for your positive feedback! We have to agree, you just can't beat the beautiful beach style lagoon swimming pool at Beach Club. This is always a hit with families, especially with younger kids as you said. As a born and bred North Queenslander, I would have to agree that the water temp might be a little cool in August for me, but that certainly doesn't stop people most from jumping in it seems. We hope you had a great holiday up to Palm Cove - the gateway to the Great Barrier Reef and the Daintree Rainforest. The reason we have returned over and over again to the Beach Club Apartments at Palm Cove is because they provide the most fantastic holiday. The rooms are comfortable and the resort offers everything we want in terms of restaurants, pools and facilities. We'll make plans to return soon. Thank you for your positive feedback. We are glad that you keep choosing The Beach Club Apartments for your holiday accommodation. Our team is looking forward to welcome you in Palm Cove soon. Relaxing and fun! Close to restuarants and the beach. The kids just loved the lagoon pool. We were always treated well by the barman at the lagoon pool - my daughters made it an afternoon ritual to enjoy a milkshake with Terry! Thank you for providing us your feedback regarding your stay at the Beach Club Apartments Palm Cove. "Relaxing and Fun" sounds like the perfect holiday! We are pleased to hear that you and your family enjoyed your stay. We enjoyed our stay at Beach Club Apartments Palm Cove very much. Thanks for your feedback Michelle, it is always a pleasure to know our guests have enjoyed their stay at the Beach Club Apartments Palm Cove. The beachfront location on Palm Cove Esplanade and awesome facilities make this one of our most popular beach side holiday properties for families and couples alike. The Cairns Holiday Specialists look forward to helping you with your next Far North QLD holiday package. I was very disappointed when I initially walked into room, very dated and dark. I had booked 1 bedroom apartment with swim up. There needs to be a TV in bedroom, and being winter, it was way too cold in the serenity pool. But loved it in the swim up cocktail bar pool, lovely and warm. I did complain about no TV and the guys were very helpful and offered us the 2nd room with TV which I really appreciated. Thanks for your feedback Margueritte, we are sorry to hear you found the room to be too dark - this is one of our most popular swim out apartments so perhaps it was the winter sun not reaching the room and pool through the rainforest gardens. Having 3 pools to choose from at the beach Club Apartments Palm Cove is a great bonus though and we are pleased the TV issue was resolved for you. We hope to welcome you back to Palm Cove in a warmer month to make use of those amazing swim out facilities. The Beach Club Apartments were beautiful! The one bedroom studio apartment was very large and comfortable. It was quiet and very relaxing. The convenience of being on the Esplanade for cafes and restaurants was awesome. The staff and locals were very friendly for our stay when I was competing in my first Ironman event. Thanks for your feedback Marie, the Cairns Holiday Specialists are pleased you enjoyed the location & facilities at the Beach Club Apartments. The on site dining is amazing in itself whilst being so close the the amazing range of beachfront restaurants and boutiques is a bonus. Great to hear you enjoyed your stay on the beautiful Palm Cove Esplanade and we look forward to seeing you in our Cairns Region again soon. We hope you took advantage of the great swim-up bar, sandy edge pool and great on-site day spa during your stay? The Beach Club Apartments Premium Hotel Room are ideal for longer stays offering basic kitchenette facilitates. We look forward to welcoming you back soon! We enjoyed our 10 day stay at Peppers over the Easter school holidays. The apartment was spacious and clean but did have a few maintenance issues that were addressed as soon as we brought them to the attention of our hosts. Th resort was perfect for our family with young children. We are delighted to hear you enjoyed your holiday at Beach Club Apartments Palm Cove. The resort is very family friendly and the Lagoon style pool offer a great backdrop to a tropical holiday. Yes I did. Tan the consultant who I spoke to was right in saying that the the Premium Spa hotel room was actually quite spacious. The photos did not do it justice at all. The suite had all the amenities and the kitchenette was quite larger (larger than what other complexes offer). Overall she was very helpful - patient and very informative in answering all my picky booking T & C questions. Dear Tam, thank you for your review and we are delighted the Premium Spa hotel room at Beach Club Apartments Palm Cove exceeded your expectations. Thanks Kim, the Cairns Holiday Specialists are pleased you enjoyed your stay at the Beach Clun Apartments Palm Cove. The Hotel Spa Room is ideal for the quick getaway and the whirlpool spa on the private balcony is a great touch. Yes, It was wonderful and relaxing. The location of this apartment is perfect. The Beach Club Apartments are ideally located in Palm Cove to take advantage of the beach and local attractions the region has to offer. We are delighted you enjoyed your stay and look forward to see you soon for your next relaxing holiday in Palm Cove. Hotel Spa room was great. Rooms clean, and well situated close to facilities. Hotel staff were great too. Central location, right on beach and close to shops. Highly recommend. Thanks for your feedback Zak. The Beach Club Apartments in Palm Cove are fantastic and the hotel rooms with the whirlpool spa on the balcony are ideal for a short getaway. Cairns Holiday Specialists are pleased you enjoyed your stay. This is now the second time we have stayed at the beach club palm cove and enjoy it thoroughly. We will definitely planning on coming back again next year. Thanks for coming to stay with us again! The Cairns Holiday Specialists are proud to have so many of our guests returning to stay in Palm Cove, Cairns and Port Douglas time and time again. We look forward to seeing you back in Palm Cove and Far North Queensland for your next family holiday. Thanks for your feedback Caitlin - The Cairns Holiday Specialists team are always pleased to hear from our guests regarding their enjoyable holiday experience. The Beach Club Apartments in Palm Cove are a great location and that lagoon pool with swim up pool bar is hard to beat! We look forward to welcoming you back to Palm Cove again - or perhaps Cairns or Port Douglas. Absolutely the best hotel, so beautiful and fantastic for kids and our room was in a perfect spot. We are so glad you enjoyed your beachside holiday in Palm Cove. The Beach Club Apartments are perfectly suited for families and the beach style lagoon swimming pool provides endless amounts of fun. The team at the Cairns Holiday Specialists hopes to welcome you back one day in the future to our slice of paradise where the Great Barrier Reef meets the Daintree Rainforest. Although we enjoyed our stay we thought the apartment would benefit from an update especially in relation to the crockery available, mugs etc. The overall stay was very enjoyable, however the unit was showing signs of age with a number of light switches not operational. 100% happy with Beach Club Apartment facilities and very happy with one bedroom suite. Yes very much. The apartment was spacious, clean and very comfortable. Great location. Really enjoyed the stay. Fantastic room, loved the pools and the location was just awesome on the Palm Cove front strip. Only minor thing was when the air con started leaking. Beautiful surroundings and very comfortable accomodation. We had a lovely time the Beach Club is a sensational property and the kids loved the swimming pools and we loved the Serenity Pool. The resort was lovely. We enjoyed our stay. Our room required some air-con' maintenance and the team did their best to help us remain comfortable. yes absolutely fantastic time - aparments were very spacious. 10 out of 10! Really good apartment, loved the location and having access to all the facilities offered by Peppers. Loved Palm Cove. We will be back. We had a beautiful spacious apartment. Aged 3,9 and 11 years perfectly. Dear Sam, Thank you for your comments, we really appreciate your feedback, we have passed your comments on to the property managers at Beach Club Apartments Palm Cove. We look forward to assisting you and your family and friends in the future for your next Palm Cove Holiday. Best regards, The Team at Cairns Holiday Specialists. Thanks Sam - Look forward to seeing you again soon. It was amazing!!! From the entrance i was amazed.The pools and swim up bar/beach! The serenity pool. The room was stunning furnishing the spa it was absolutely beautiful. Thanks Jessica - look forward to seeing you again soon. The facilities it self that the beach club apartments had to offer were amazing, friendly staff and locals made our stay enjoyable. The room we stayed in which was the premier spa room was average. Hi Jessica, thanks for the feedback. there are a number of different room types at the Beach Club which offer different things depending on what you are after. This resort is absolutely fantastic, the facilities, position, apartment, restaurant and staff service are outstanding. Our holiday was terrific. The lagoon pool is simply out of this world, we felt we could have been anywhere in the world! Top class resort, we can't wait to go back. Dear Suzy and Steven, Thank you for your comments we really appreciate your feedback, we agree the property is fantastic, we look forward to assisting you again on your next visit to Palm Cove. was perfect & the service on arrival & departure was warm & friendly. Thanks Leah, Look forward to seeing you again soon. We absolutely loved the Beach Club Apartments. They were spacious, clean and beautifully appointed. The resort itself was wonderful, especially when travelling with young children - this place was PERFECT in every way! I can't recommend it highly enough. Pleased you enjoyed you stay come and see us agin soon. The Beach Club Apartments in Palm Cove are exceptional. We had a fabulous time with our 2 kids (ages 8 & 3). The pool at the resort is one of the best we have seen and is ideal for the younger kids. The apartment was very spacious with everything that you would need. The location is ideal being directly in front of the main part of the Palm Cove Beach & kids playground. A great holiday destination - we will be back! Thanks for your feedback - see you here again soon. We had a lovely time at the Beach Club Apartments Palm Cove. We were treated like VIP's on arrival and we were upgraded as well. It was a beautiful apartment and it was clean. What a beautiful place to stay! Staff were lovely and helpful, and the room was even better than we expected. Beach Club was great for either couples or families! We absolutely loved our holiday at Beach Club Apartments. A wonderful location and a great apartment. Thanks Nicole - look forward to seeing you in Palm Cove again soon. Was heaven, so peaceful, relaxing and perfect weather. Excellent gym, quiet time in the serenity pool and a cocktail or two at the swim up bar. We actually enjoyed no room service, it was nice to be left to our own devices and do things in our own time. Nope nothing could improve our visit, we weren't there to be entertained, rather just to kick back and do nothing. We did indeed enjoy our stay at Beach Club apartments. The 2 bedroom penthouse apartment was fantastic ( the furniture a little worn in the lounge area) but overall very nice. The kitchen area however did have a huge amount of ants which was hard to keep on top of each morning! The other down side was that we did not realise that the hotel staff would not be as helpful because we were staying in a 'private' room so things like room service , helping with bags and queries we had during stay with some noise one night were not attended to by the hotel staff and they were sometimes quite rude. We understand that we were not paying for their service but were made to feel a little unwelcome compared to our last stay which we booked directly. However we had a wonderful time- the only other downside was that we were not informed before our stay that a large majority of the restaurants would be closed as we went during quiet season- it just made dining out a little harder and less enjoyable than anticipated. We also were a little disappointed with the cleaning we received. The balconies were not brushed or mopped at all the entire 2 weeks and the room was vacuumed once on request- i would expect more from a 5 star apartment service. Otherwise a very relaxing and enjoyable 2 week break. Dear Shelley, thank you for your comments we do advise our customers to deal directly with the offsite reception staff when staying in these properties, it would be nice if the reception staff were more helpful to the guests staying in the privately managed apartments, which may mean that you would use the services of the hotel more also. Thank you also for the comments regarding the restaurants unfortunately we were also not informed that the restaurants would be closed during your stay, this does not normally happen in Palm Cove. Thank you and warm regards, the team at Cairns Holiday Specialists. Thanks Shelly for your feedback. Your points will be brought up at our next meeting. Absolutely loved it!!! What a great place, three pools to choose from and everything looked amazing. Could not fault it and the staff were very friendly and helpful. Was the perfect honeymoon for us. Very much so. The hotel is spectacular. The pool's are AMAZING. Room was clean and beautiful. Bed was very comfy. Only downside was the renovations that for half of our stay we couldn't use the walkways. We had to walk down to the carpark and up another lot of stairs to get to anything in the hotel. Some for warning would of been good. Please you had a fantastic time at the Beach club and your point is taken re painting. Had a very enjoyable stay at the Beach Club apartments. We had a beach front penthouse apartment with a great view. The apartment was lovely pity the weather was cooler as we did not get to use the plunge pool. Great location and wonderful pool for the children. Pleased you had a great stay. See you up this way next time. We stayed in a one bedroom apartment with ocean views and we also had a plunge pool overlooking the lagoon pool. The best of both worlds. The apartment was spacious and having a full kitchen was handy. It would have been nice if there had been some complimentary toiletries supplied (handwash, shampoo and conditioner)just to get through the first 24 hours. We had a good look around the other resorts in Palm Cove while we were there and we were very happy with our choice of the Beachclub. In saying that there are lots of top class accommodation choices in Palm Cove with great pool areas. Lots of reviews I have read on Palm Cove complain about the cost of meals at restaurants but we didn't think they were excessive. Any restaurants that are expensive can be easily avoided. We would recommend Casmar (seafood platter) and Chocdee (Thai) in particular. Chill and Coffee Haven are also good value for coffee and light meals. The dinner vouchers from Cairns Holiday Specialists are worth getting as soon as you arrive to make full use of them during your stay. Dear Peter, Thank you for your comments regarding Beach Club Apartments and the dining options in Palm Cove, We also strongly recommended collecting the dining vouchers early, this is also a benefit for any touring you want to do as we will give you discounts on tours in the region so you can experience the very best that Palm Cove and Tropical North Queensland has to offer. Kind Regards Cairns Holiday Specialists Team. The Beach Club is a fantastic property - we are delighted you enjoyed your stay. I stayed at Peppers Beach Club Apartments in September 2010 for 7 nights. The upgrade to The Penthouse was much appreciated and a quality setting for the reviving break I needed. For me, a single traveller all I needed for my stay was in the room & bathroom. I was appreciative of the bath towels and the beach towels. I did find, however, it hard going upon arrival at 6.30 pm to have to lug a heavy bag and groceries up 4 flights of stairs. Because I was staying independently of the Peppers Resort I had no assistance I could call on. It was hard too, finding my way in my hire car to the street entrance to the carpark for my unit. In my opinion this needs a re-think. It was stressful and dark so it took me sometime to work it out upon arrival after a flight delay. However, the next day I was told at the office ( near Coral Horizons) that someone had stayed back for a bit longer after hearing of flight delay. But I arrived after that. The resort was FANTASTIC!! The facilities were superb, the rooms were gorgeous, and the staff were all very friendly. Cant wait to come back! We had a wonderful time, everything even the weather was fantastic. The only problem, was our bbq wasn't working. The Beach Club as a venue was excellent. It was disappointing that the room we stayed in did not have towels for the pool and the reception would not lend us towels as we were staying "privately" and that should have been supplied in our room, according to the reception. The lady on the desk was very rude and would not assist at all. We ended up having to buy towels to use at the pool and beach. We also didn't receive any of the meal vouchers that were indicated when we booked the holiday. This really didn't bother me but it might some people. If at anytime anything is missing all you need to do is call us and we shall deliver them to you immediatley. We really loved our stay at "The Beach Club" particularly unit 6122 in the Serenity block.The food in the Restaurants was superb and the Pools and overall stay absolutely wonderful. Thanks for your assistance in giving us a very memorable holiday experience. We will be back! Apartment was great, the only draw back was it needed a gate on the balcony so that we could keep our toddler in and relax. The other thing that I was a little disappointed in was the fact that I had to go shopping for dishwashing and cleaning products. Not enough dishes to put in the dishwasher for a load but no liquid to wash.
Our accommodation at the Beach Club Apartments was fantastic. The two bedroom apartment we stayed in was great with plenty of room. The resort itself was very tranquil and relaxing, we spent alot of time in the three wonderful pools.